To keep better tabs on human-wildlife conflicts, or injured, aggressive, or orphaned animals, ADF&G has created an online wildlife encounter report form. A few years ago, Alaska Department of Fish and Game biologists in the Anchorage office started noticing something odd. The number of bear calls seemed to be declining, and then sometimes the biologists would hear about a bear situation that had been posted to social media, but was never officially reported to the Department. 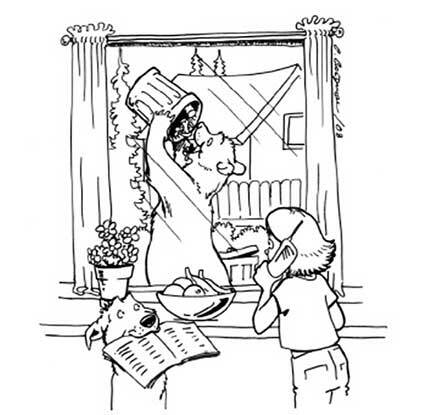 Bear incidents were not necessarily declining, but the calls were. As everyone knows, the way humans communicate is changing because of social media, and calling by phone is no longer the preferred method of communication for many people. To keep current, and hopefully keep better tabs on human-wildlife conflicts, or injured, aggressive or orphaned animals, ADF&G has created an online wildlife encounter report form. The form was initially created so people can report orphaned animals, and mimics other online ADF&G reporting forms. Existing forms, for example, allow people to report invasive species online, or to make a citizen science report on a bat sighting. It’s not quite an app, but close. The wildlife encounter form was designed knowing that many people would use a mobile phone to make their report. On iPhones, you can add an app button to your home screen by opening the website, clicking on the share icon, and then choosing the option, “Add to Home Screen.” An app will appear on your home screen that then, if tapped, will lead you directly to the reporting form on the website. So, if you see a bear in your neighbor’s trash, you won’t have to search for the website – just click on the ADF&G logo icon created on your home screen. The form should take just a few minutes to compete. 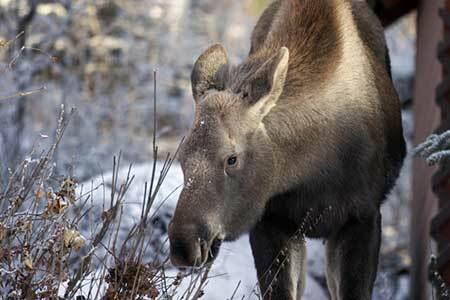 A young moose browses in a backyard in Anchorage. Photo by Ken Marsh. The form itself is self-explanatory and covers more than bear encounters. It asks for information including encounter type, address of encounter that includes a pin-drop map, the species of animal, date, time and whether the animal is injured, orphaned, or if something else is going on, like a human-wildlife conflict. If you’re confused about what to report, scroll down below the form for more information. ADF&G would like to receive information about injured and sick animals (except marine mammal strandings which should be reported elsewhere), orphaned animals, wild animals that are aggressive or approaching people, dangerous moose encounters, bear sightings of concerns (like brown bear sightings in neighborhoods), and bears in garbage. There’s nothing that limits what you report. If you think it’s of concern, please feel free to use the form to report it. There are plenty of open fields to allow for flexibility. As stated on the website, you may get a follow-up call from ADF&G, or you may not. The reports will be sorted and reviewed by the Wildlife Information Center staff in Anchorage and routed to biologists depending on the situation and area of the encounter. Of course, telephones still work and ADF&G still welcomes phone calls. If you grew up using a phone and are more comfortable talking to someone in person, please feel free to call your local ADF&G office to file a wildlife encounter report. ADF&G area offices and contact numbers.